Namibian students and living in Namibia (Windhoek, Rundu, Gobabis, Rehoboth, Luderitz, Karasburg, Walvis Bay. 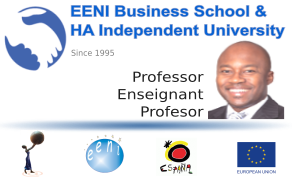 Namibië): Study at a distance at EENI Business School & HA University. Borders of Namibia: Angola, Zambia, Botswana, Zimbabwe and South Africa. The Republic of Namibia: "Unity, Liberty, Justice". Main towns: Walvis Bay, Oshakati, Otjiwarongo, Lüderitz, Gobabis, Keetmanshoop, Tsumeb, Swakopmund, Rundu, Katima Mulilo. EENI- The Global Business School can provide financial aids, instalments, or discounts cash payments for Namibian students applying to EENI Business School & HA University.